TimeCard Plus is a piece of software designed to let you track employee time and attendance, and it can also calculate regular, benefit and overtime hours. The application will automatically calculate the benefit hours your employees have earned according to your own set of policies. It can also record the hours during which employees were absent from work. Multi-user access is provided which means that more than one user is able to access and update the information simultaneously. Shift indicators are included, as well as the option to set different overtime policies for individual employees. 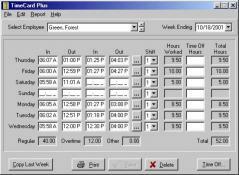 On top of that, TimeCard Plus allows you to enter up to four sets of punch-in and punch-out times for each day. Moreover, the application can generate reports for time off and hourse worked, as well as a benefit balances report which you can give to your employees.